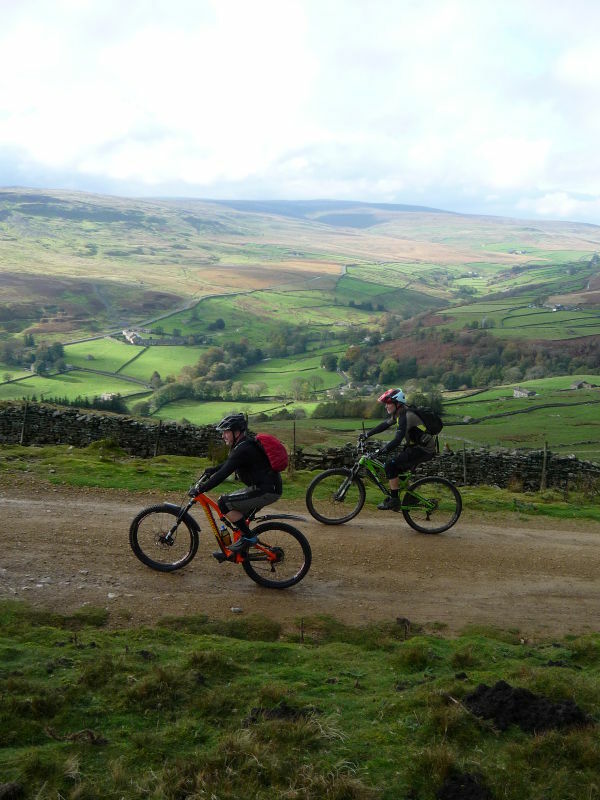 This mountain bike route of 21.5 miles starts from the Dales Bike Centre in Swaledale, which is set in the North East corner of the Yorkshire Dales. 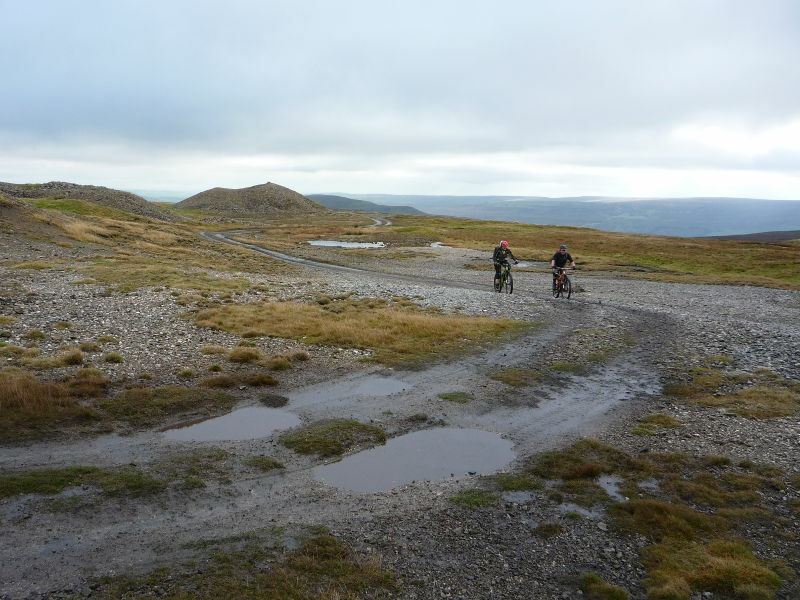 The route circles Arkengarthdale, predominantly using the rocky double track that covers the area but with a good amount of singletrack mixed in too. 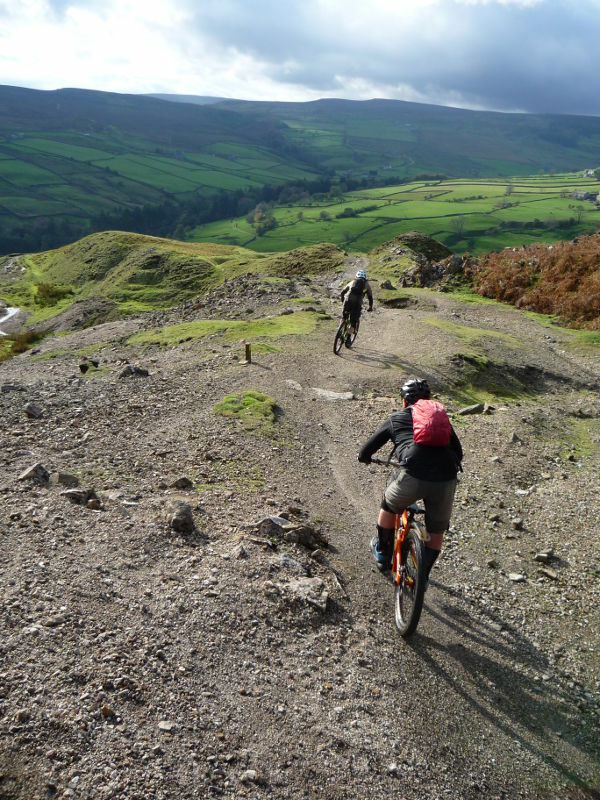 Starting with a big climb out of Swaledale the route drops through Arkengarthdale before taking in the long and fast School Master Pasture descent, the fantastic quarry descent to Storthwaite Hall and then returning along the fun singletrack below Fremington Edge. 1. At the exit of the Dales Bike Centre turn left onto the main road and follow it to the next junction a short distance later (GR046989). 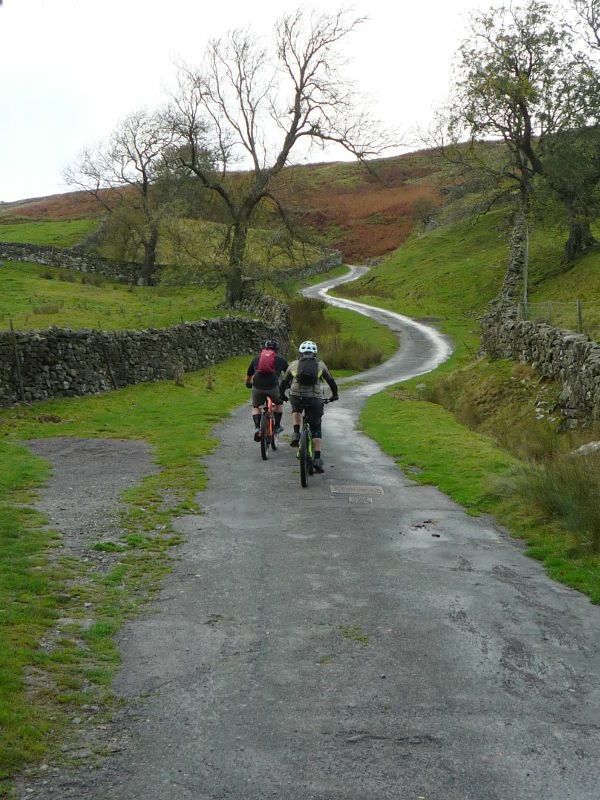 Follow the main road left, towards Reeth. 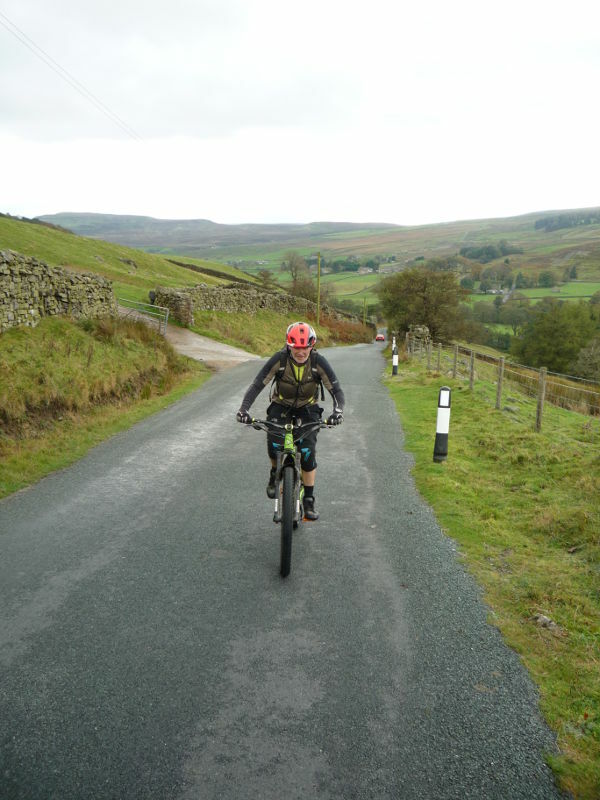 Go left over the stone bridge then right as the road climbs into the middle of Reeth. Follow the road across the village green to a junction at the far corner (GR038993). Follow the main road left and climb out of Reeth. Continue along this road and descend into Healaugh, the next village. After passing a line of cottages on the left the road comes to the first junction in the village, with a thin lane on the right by a row of cottages on the right heading away from the main road (GR017990). 2. Turn right and follow the lane between the houses to a gate. Go through the gate and climb out of the valley up a steep, winding lane. It is pretty evil but doesn't last too long. A short distance after the gradient reduces significantly the lane comes to a junction by a house (GR012995). 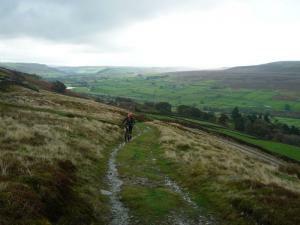 Go straight on and climb the rocky double track with the drystone wall on the left. At the next junction a short distance later, where the main trail descends to the left, take the rockier track that climbs to the right. Climb the track to a four-way junction just after passing some sheepfolds on the left (GR005999). 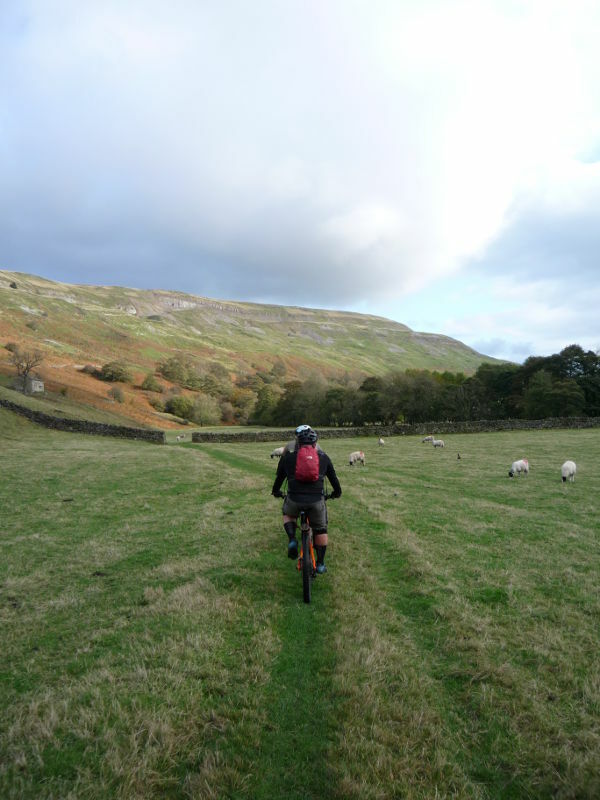 Take the grassy singletrack on the right that follows the marker posts across the bottom of the next sheepfold, ahead on the right. Continue climbing gently straight on for a while until the trail becomes rocky and kicks up to the left. 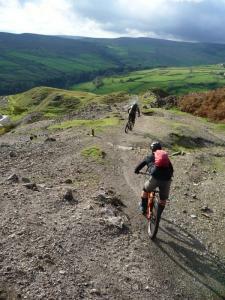 At the top of this short, steep climb follow the trail right for a rocky descent to a junction. Turn left and descend a short way to a gate (GR992009). 3. After the gate turn right and climb the lane to a junction at the top (GR993015). 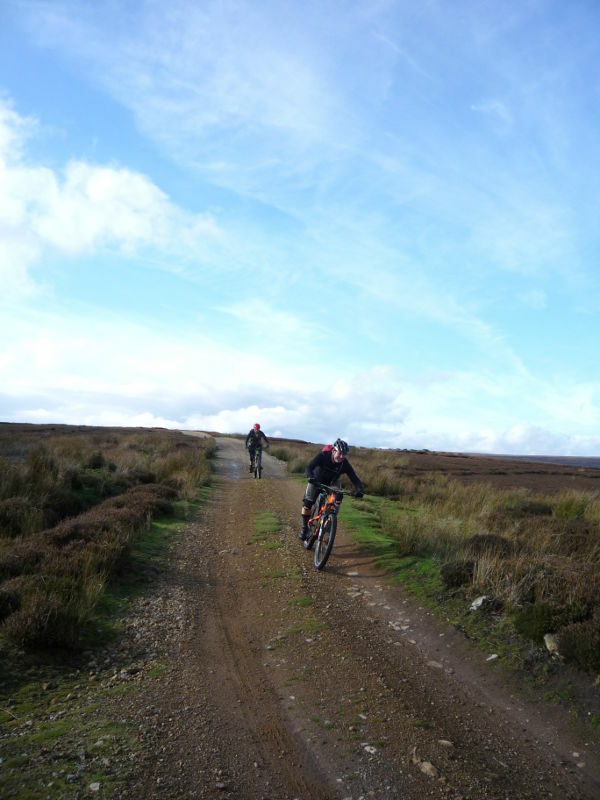 Turn hard left onto the rocky double track signposted as a bridleway. Follow the track immediately through a right hand bend then on to a much longer left hander. Continue climbing the track to a junction on a steep section with a level track on the right. 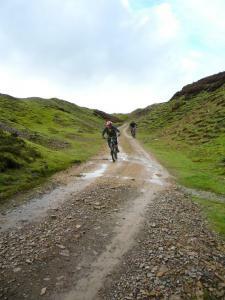 Continue straight on up the steep climb towards the spoil heaps. The track levels off at the spoil heaps and comes to a junction just after (GR987021). Turn right then follow the track through a left hand bend before a straight, gradual climb to the next group of spoil heaps. 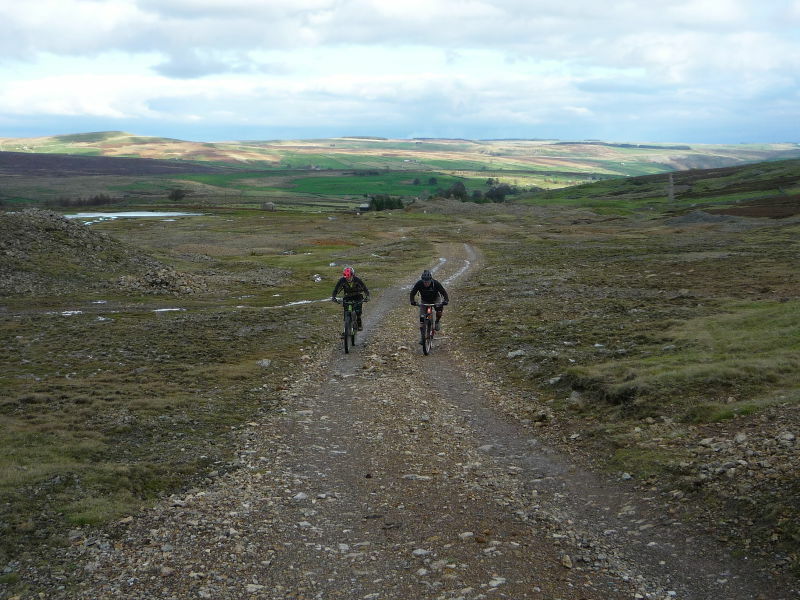 At these spoil heaps follow the track through a right then left hand bend, then follow the rocky double track along the ridge of the hill above Arkengarthdale on the right. Continue ahead along this track until it comes to a three-way junction marked by a line of small cairns (GR974030). 4. 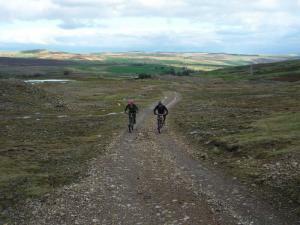 Turn right and descend the loose, rocky double track to a sharp left hand bend. Follow the track left where the track becomes grassy and rutted. After a couple of rocky bends the track comes to a junction on a plateau, with a grassy track on the right (GR976035). Turn sharp right and follow the grassy track as it descends gently across the side of the hill, being careful of the odd muddy hole. The track eventually bears left to a low, straight cutting. Stay high and left of cutting as water drains through it, making it very soft. Continue following the track ahead to a wide, open area of earthworks. Continue straight on across the top of the gravelled area, across the low spoil heaps. Near the far side follow the vague double track left and go diagonally across the gravelled area to a double track trail in the opposite corner. Follow the double track to where it ends at a junction with a lane (GR990038). 5. Turn right and follow the lane down to the houses and a junction with a lane on the left, signed for Barnard Castle (GR998033). Turn left and descend to the bottom of the valley. Continue along the lane and climb between the drystone walls. After the drystone walls continue climbing to a junction with a wide and rocky track on the right (GR004048). Turn right and climb the track through a couple of bends, then across the face of the hillside all the way to a three-way junction on the far end of the ridge (GR009037). 6. Turn left and climb the rocky double track to the top the top of the hill. At the top the track bears right and starts descending. 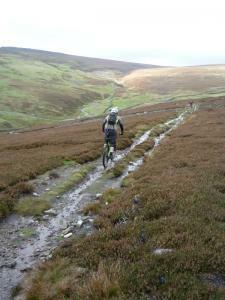 After a while the track descends left into a gully. Wind down through the gully and take the right hand track where it splits, near the bottom. Exit the gully and follow the main track left to climb past a hut on the right. After the hut follow the track a four-way junction (GR025044). Turn right and descend the rocky double track, which soon turns left. After the corner follow the track straight on as it undulates across the top of the hill. Continue following the track ahead as it starts going downhill for the long descent to Schoolmaster Pasture. After quite some time the track comes to a junction at a stone wall ahead (GR057040). Go straight on, to the right of the wall, and descend to a farm. At the farm the track bears right and descends to a junction (GR061035). 7. Turn right onto the lane then descend to the bridge in the dip. Bear left over the bridge then go up a short climb. 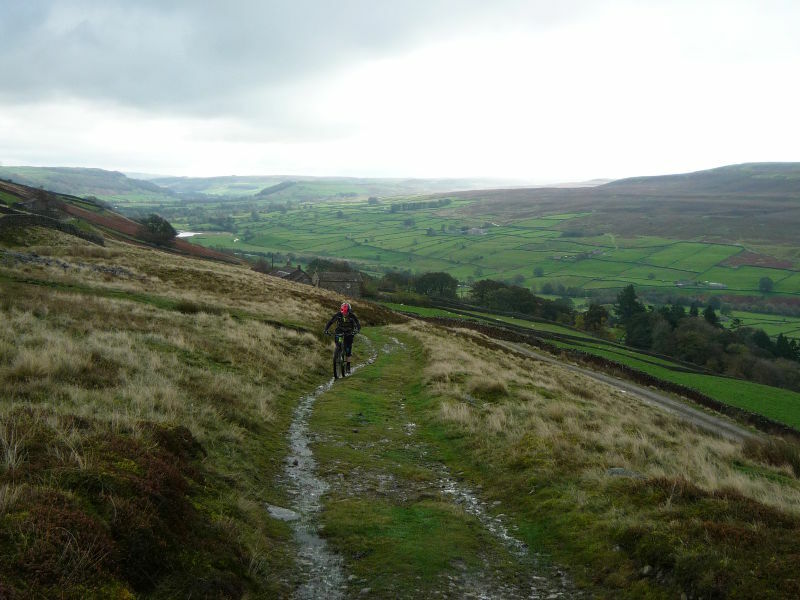 Bear right at the top and descend through Washfold, in the next dip. Climb out of Washfold a four-way tarmac junction (GR052026). Go straight on and climb to a junction with a rocky track on the left at Hall Farm in Hurst. Continue straight on and go through the gate then climb the rocky double track through the old earthworks. 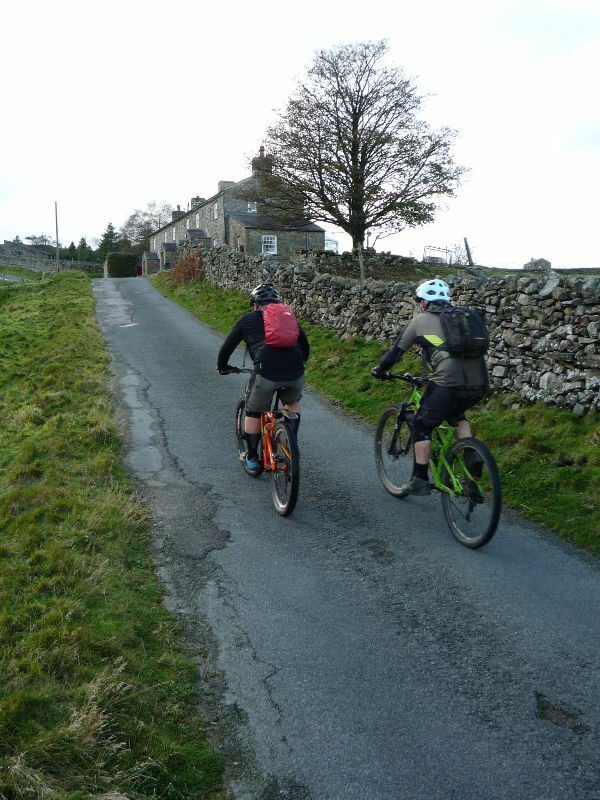 Continue climbing the track ahead all the way to the top where it goes through a right then left hand bend before reaching a junction with a muddy double track at the bridleway marker post. 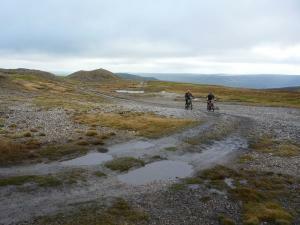 Turn left and descend the muddy track to a gate (GR032021). 8. 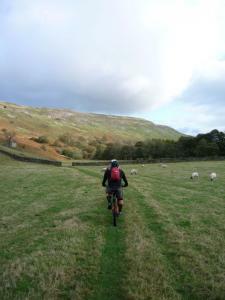 Go through the gate and follow the grassy, boggy singletrack straight on. Continue straight on when the track opens up and gets much firmer at the top of the earthworks. Follow the cairns through the gravel then, after skirting round the left of a small spoil heap, bear right at the large cairn and descend a short, rocky chute. 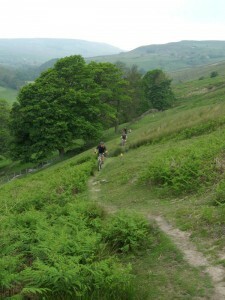 After this descend the wide, grassy track ahead to a rocky track on the edge of a steep drop. Bear left and follow the track for an exposed traverse across the top of an old quarry. At the far side of the quarry drop through a rocky right hand bend. Descend the remaining rocks out of the quarry to a grassy section that leads to a gate in the drystone wall on the left (GR019024). Go left through the gate and descend the grassy track through a number of bends. 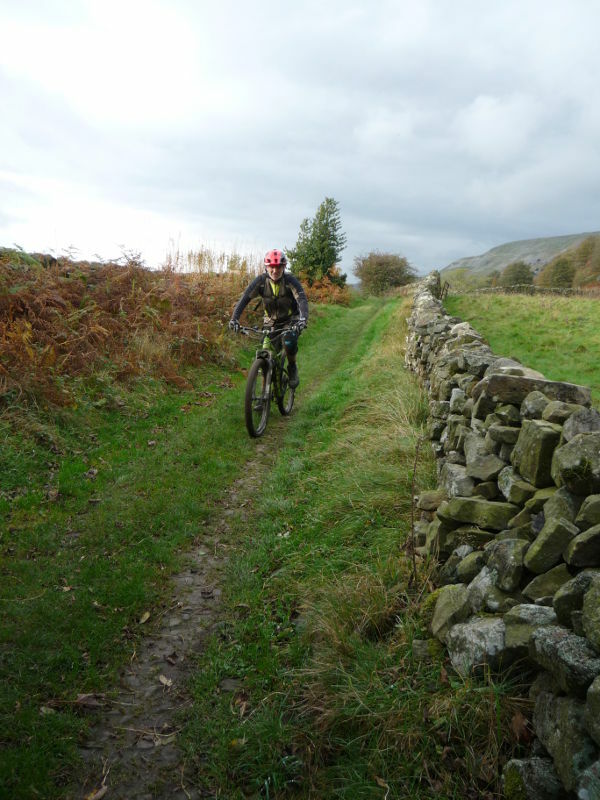 The track becomes increasingly rocky as it loses height and ends at a gate near Storthwaite Hall (GR018021). 9. After the gate turn left and descend to another gate, to the right of a farm. Go through the gate then follow the track across the field to gap in the drystone wall, ahead and slightly left. After the gap continue straight on to a gate by the river in the far corner of the next field. 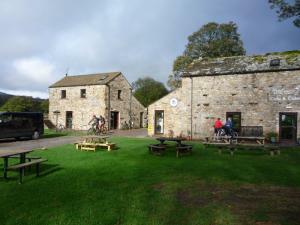 Go through the gate and climb the rocky track on the left to Heggs House (GR025018). Directly before the house follow the marked bridleway left and climb to a gate above the back of the house. 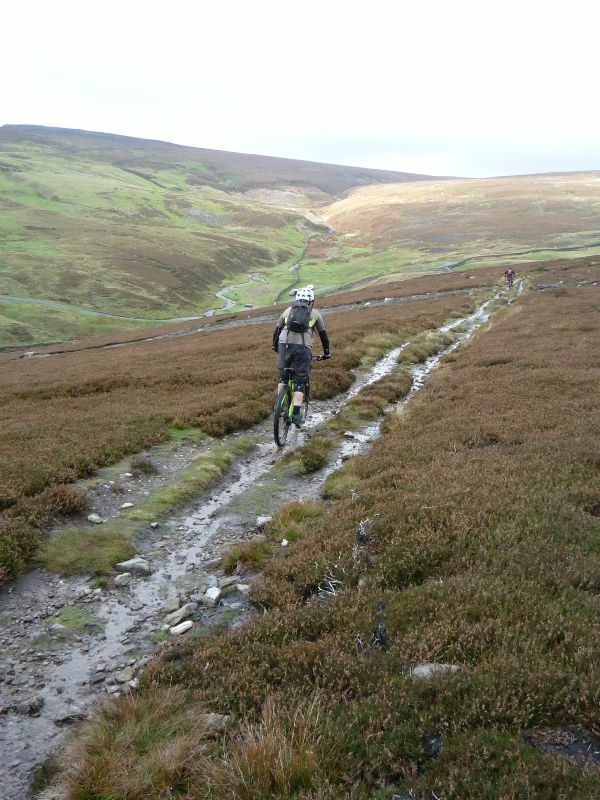 After the gate climb the singletrack left a short way to the next junction. Turn hard right and climb the singletrack across the face of the hillside to a gate in the drystone wall ahead (GR026018). 10. 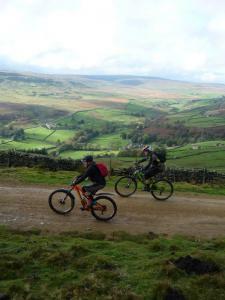 Go through the gate for a tricky section of singletrack dotted with rocks, as it traverses the valley side. Be careful of the drop on the right. At the next junction, with the track down to Castle Farm go straight on, keeping the wall on the right. Stay high at the junction with the footpath that follows shortly after, where the drystone wall drops away slightly (GR032010). 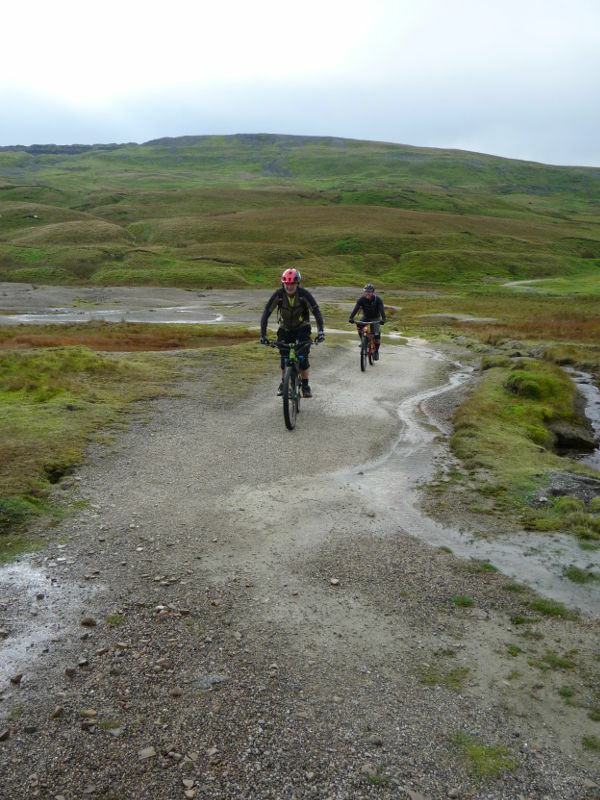 Climb across the off camber grassy slope to where the wall comes back up to meet the trail. Continue following the trail ahead, which soon goes down a steep muddy and grassy descent to a junction by the river (GR034005). Climb the rocky track off to the left. Continue ahead along this track as it continues traversing the hillside. Eventually it becomes enclosed by drystone walls before reaching a three-way junction. Follow the right hand track that then turns immediately left before eventually ending at a junction with a lane (GR046993). 11. Turn right and descend to a lane junction in Higher Fremington (GR047991). Go straight on then turn left at the next junction a short distance later, to follow the crenulated wall. At the junction at the corner of the wall turn right to continue following the wall. 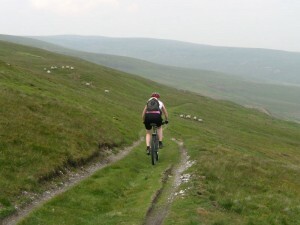 Descend the steep, thin lane to a junction at the bottom (GR046989). Turn right to a junction with the main road. 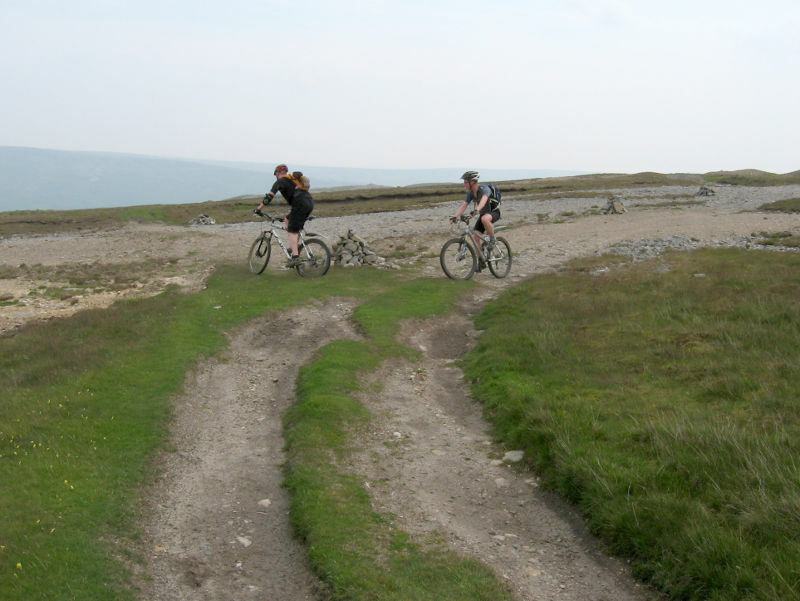 Turn left and follow the main road back to the Dales Bike Centre on the right to complete the ride.